Anything you think about chocolate will be changed after trying Peluso Chocolate from Sicily. This special chocolate is not just about eating chocolate, it is about eating a story. And Peluso Chocolate is the Please The Palate pick of the week. Peluso chocolate is called chocolate “made in the cold.” This recipe was created in 1746 in the southern city of Modica in Sicily and has been made the same way ever since. The cocoa seeds are ground and mixed with sugar. Those are the only two ingredients! There is no butter or oil or milk added. The processing is done at a low temperature of 90 degrees Fahrenheit. By processing it at a low temperature, the healing properties of the cocoa are maintained (they are typically lost when the temperatures reach more than 104 degrees). The healing properties of cocoa are tannins, which have antioxidants and blood pressure regulators. That means that this chocolate has benefits for cardiovascular health, antibacterial protection and safeguards against viral diseases. Flavanoids (which offer protection against tumors) ensure better liver function and help strengthen immune defenses to fight free radicals. The health benefits alone should entice you to want to eat this chocolate that is also organic and gluten free. But it is the taste that stands out and will hook any chocolate lover. 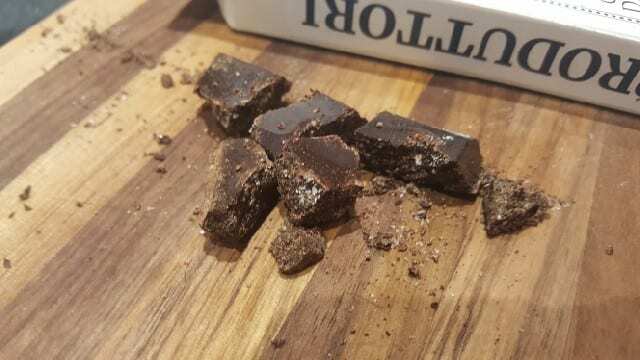 Peluso chocolate has a unique taste and texture. If you look closely at the chocolate, you can see the crystallization of the cocoa and sugar. The chocolate does not melt in your hands or your mouth. The texture is delicate and the taste is pure. 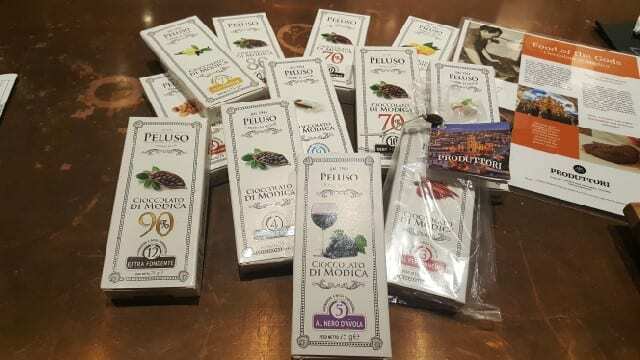 In addition to plain chocolate, Peluso chocolate comes in a number of flavors, including orange, nero d’avola, pistachio, pepper, salt, cinnamon, vanilla and almond-hazelnut. The added ingredient is so pure as well that when I tried the cinnamon, it tasted like fresh cinnamon. And the pepper chocolate is so subtle with a delayed heat that covers the palate after a short delay. The Italians have called this chocolate the “food of the gods” and perhaps this ancient chocolate is the secret to a healthy mind and body. If you want to try Peluso Chocolate, the Please The Palate pick of the week, you can find it in some gourmet wine and food shops around Los Angeles, including The Wine House (West LA), the Beverly Hills Cheese Store (Beverly Hills), Sorrento Italian Market (Culver City), Wally’s Wine & Spirits (Beverly Hills) and Bar & Garden (Culver City). This entry was posted in Food, Lifestyle and tagged Bar and Garden, Beverly Hills Cheese Store, chocolate, food, Italian chocolate, Modica, Peluso, Peluso Chocolate, pick of the week, Please The Palate, Sicilian Chocolate, Sicily, Sorrento Italian Market, The Wine House, Wally's Wine and Spirits by Allison Levine.